Snow, ice, wind, salt, and cold are not the only winter threats to trees and shrubs. Learn how to prevent winter deer from eating your plants and shrubs. Gardeners and farmers know, winter deer activity can cause major damage to trees. Here are the solutions to deterring deer. Deer forage on trees or shrubs when food becomes less available in cold weather months. They cause damage to yards, orchards, and woodlots. Hungry deer will eat evergreen leaves, dormant buds, plants, shoots, and saplings. Trees and shrubs can be completely stripped of buds or new growth. This destroys branches and entire plants as well as reducing crop production for orchards. From early fall into winter, bucks mark their territory during mating season by "rutting." Rutting is scraping against tree trunks to rub off the soft velvet that covers their antlers. Rutting scrapes bark off tree trunks. This causes extensive damage to the tree’s vascular system. A tree is not likely to survive after deer scrape off the bark all the way around the trunk. Wrapping tree trunks with breathable tree tape is a good defense against rutting. Tree wraps made from paper or burlap also protect trees from rutting. Wrapping can also protect tree bark from winter sun scald and frost cracks. Take care to remove wrapping in the early spring to avoid damaging your tree. These work in a similar manner as tree wraps but are generally made of plastic tubes or pipes. Take care not to damage the bark of the tree when installing or removing them. Remove the the tree guards in the spring to avoid damaging the tree. Wrap evergreens, shrubs and small trees in burlap or other breathable plant covers. This will discourage foraging deer. Wrapping also protects evergreens from winter burn and road salt. A deer fence provides effective protection for a yard, orchard, or farm. 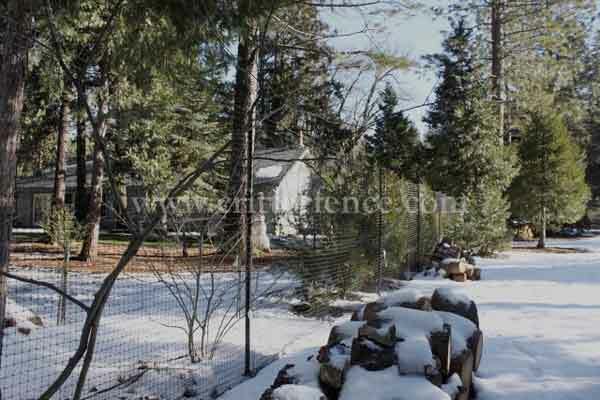 A deer fence protects a yard or grove in its entirety. It can also protect individual plants, gardens, or groupings. Place small fences or wire cages around individual trees, shrubs or around small groupings. This is a good option if fencing an entire area is not required or is not practical. Deer repellents discourage deer from damaging unprotected trees and shrubs through scent or taste. There are many commercial spray repellents available. Repellents can be as simple as hanging bars of soap on strings or in mesh bags. Repellents are only deterrents. They don't stop a deer from damaging trees. A hungry deer in winter will eat food even if it finds them unsavory. Bird feeders and open compost containers can attract deer. Removing these food sources lessens the chance encouraging damage to trees and shrubs. Your local native plants are good candidates for being deer resistant. You may wish to consult a local nursery to see if they carry deer resistant native plants. Although some shrubs and trees are deer resistant, they are not deer proof. When a deer is hungry in the winter, these deer resistant shrubs and trees will get eaten. The most effective solution for protecting orchards and shrubs in the winter is a deer fence. A deer fence is humane and provides as close to 100% protection against deer as any solution can get. It is the most dependable solution for protecting trees and shrubs from winter deer.